This Muhammad Ali action figure has been in my collection for many years. He was made by Mego in 1976 and has a boxing action. He came on a card and his accessories included his boxing shorts, shoes, belt, sparring helmet, gloves, trigger mechanism, and instructions. I think Mego did a reasonable job with this figure. He does kind of have an attitude – even when he is not posed. Unlike GI Joes that bend on the outside of the action figure, Muhammad Ali’s knees and elbows bend but are covered by his “skin”. He is also a couple of inches shorter than GI Joe action figures. Ali’s wrists and feet have some limited motion (but not as much as Joes) and his arms rotate at the shoulder. 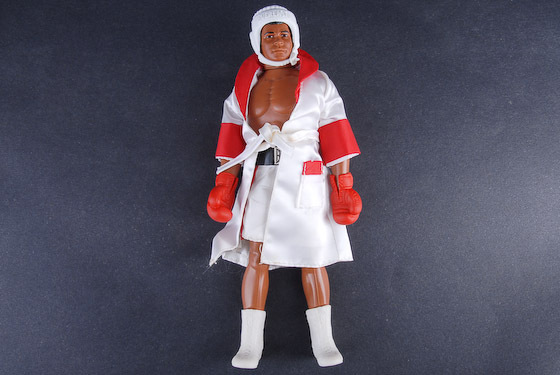 What made the Muhammad Ali action figure so special four decades ago was that he boxed. (You can imagine kids in the 70s going crazy for him.) Basically, you take the trigger mechanism and hook it into the sides of his belt. Then you pull down and lock the “pusher” into the slot on the back of his belt. When you push in the button on the trigger mechanism it rotates the Muhammad Ali figure’s torso and pushes its arms back and forth. The action mechanisms frequently squeak, although the action figure itself doesn’t if you rotate it manually without the mechanism. I made a video below showing how he operates.